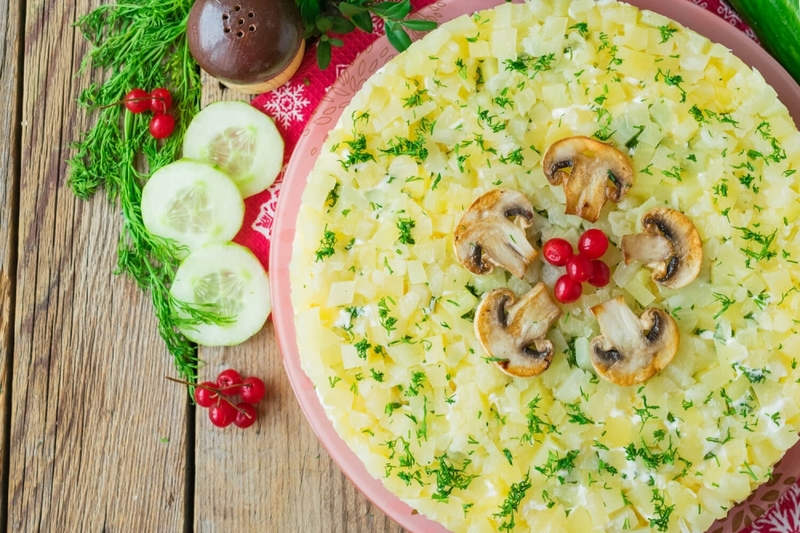 Tasty and juicy «Fiesta» salad suits perfectly for everyday life and for a holiday table. 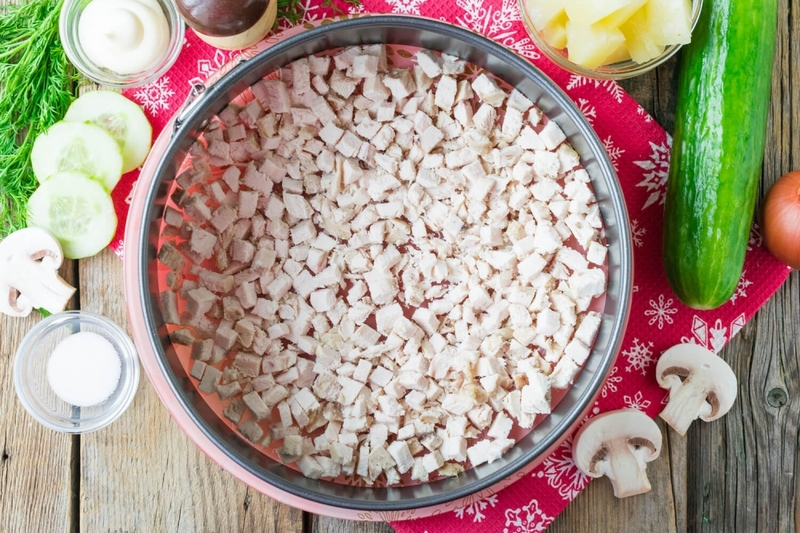 Boiled chicken fillet, fried with onions champignons, hard cheese and tinned pineapples are its parts. Put all ingredients for salad in layers so that the ready dish looked elegantly and appetizingly. 1. 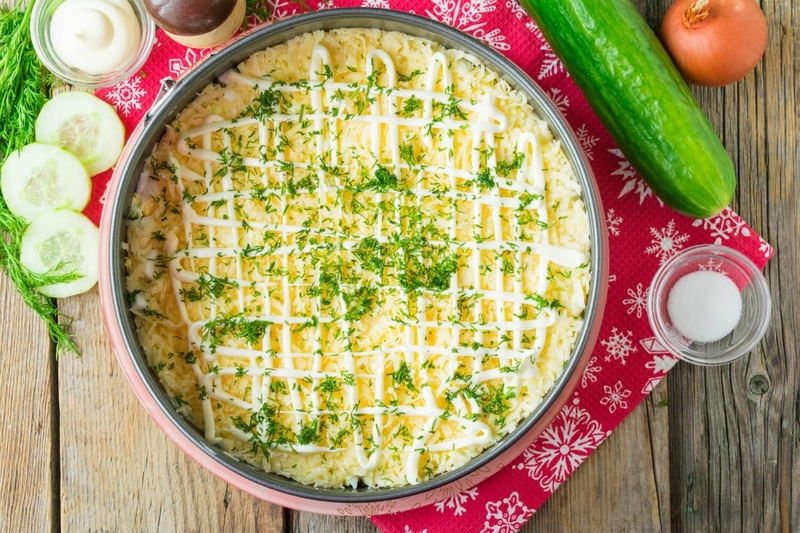 For gathering «Fiesta» salad we will use flat wide dish and culinary ring or a side from detachable baking dish with a diameter of 20 cm. Cool boiled chicken fillet to room temperature and cut into small cubes. Lay out the cut meat on a dish, season it with black ground pepper and grease with a small amount of mayonnaise. 2. Wash, and cut into cubes fresh champignons. 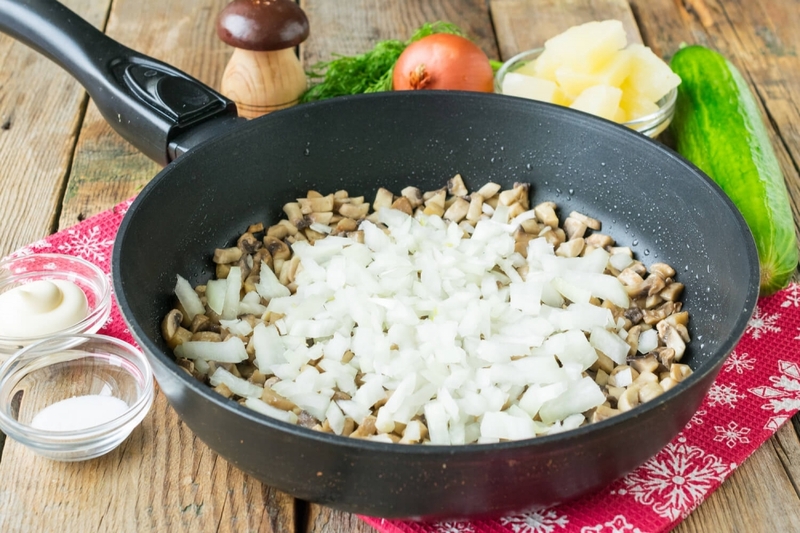 Put the chopped champignons on the preheated frying pan with vegetable oil. 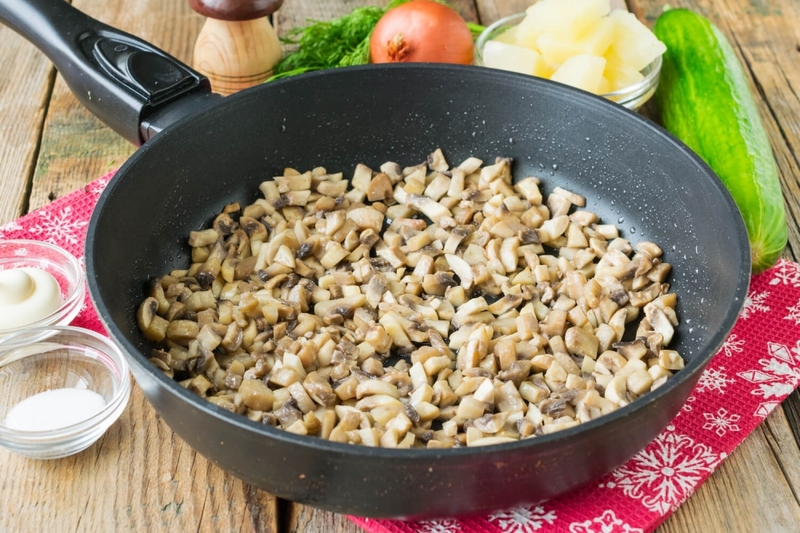 Stirring slowly, fry champignons until all liquid is evaporated from a frying pan. 3. Then add the small cut onions to mushrooms. Mix and continue to fry ingredients together till golden. After that, cool fried with onions champignons to room temperature. 4. 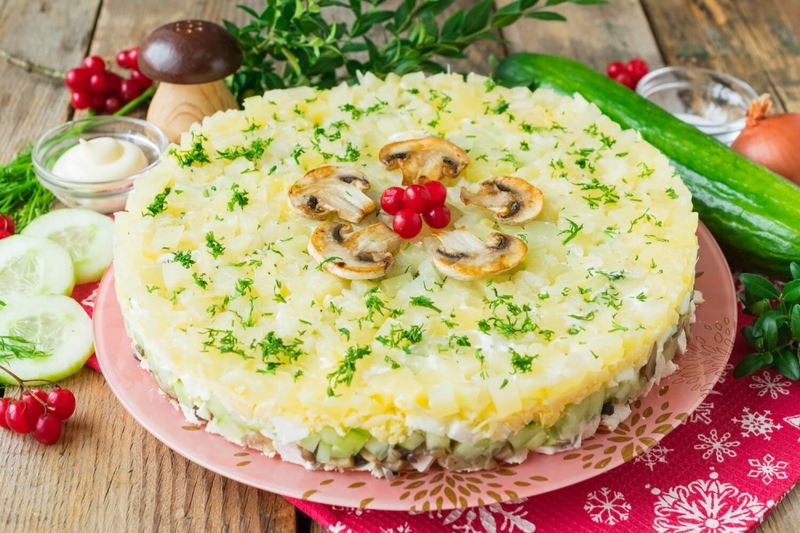 Lay out mushrooms with onions over a layer of chicken fillet. Add salt and black ground pepper to taste. Put a thin layer of mayonnaise on the top. 5. 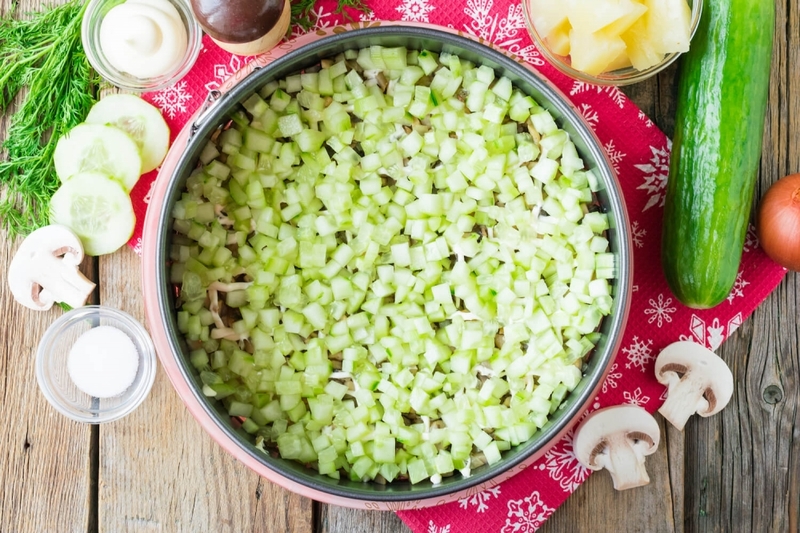 Wash, peel, cut into small cubes and spread evenly on all perimeter a fresh cucumber. Grease a layer of vegetables with a small amount of sauce. 6. Boil hard chicken eggs, cool, shell and cut into pieces. 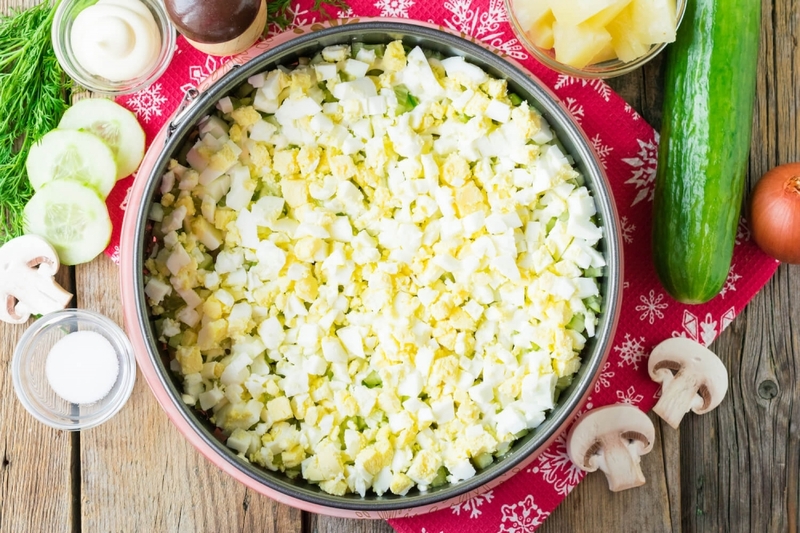 Lay out boiled eggs over cucumbers and grease with mayonnaise. 7. Grate a piece of hard cheese on a large grater. 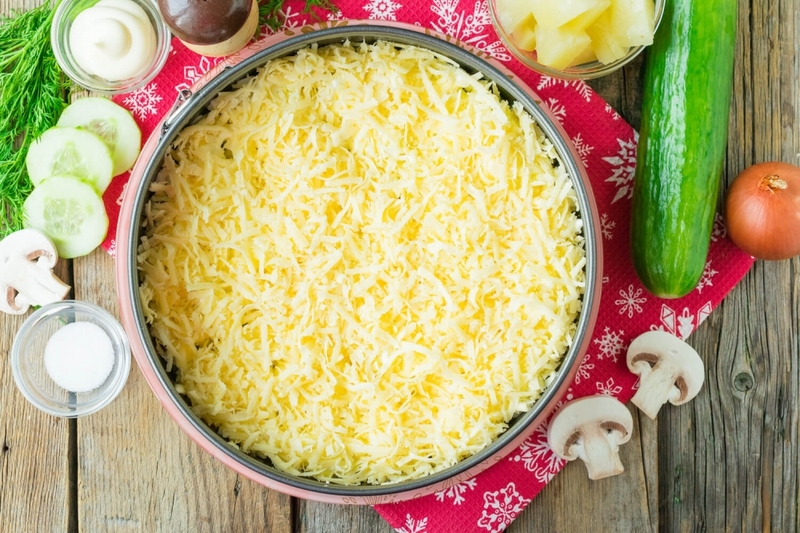 Spread evenly on all perimeter grated cheese. 8. Put a thin layer of sauce on the top. Spread evenly on the top small chopped dill. 9. 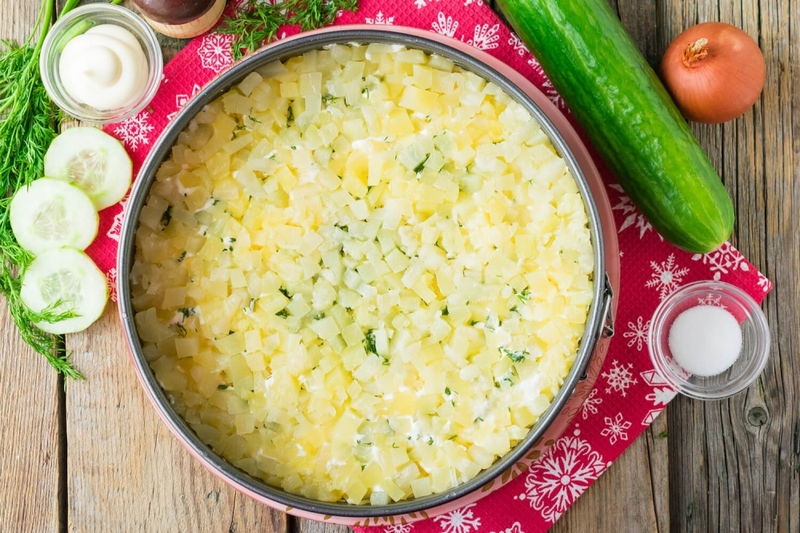 Filter tinned pineapples from marinade and cut into cubes. Put the cut fruits as the last layer. 10. 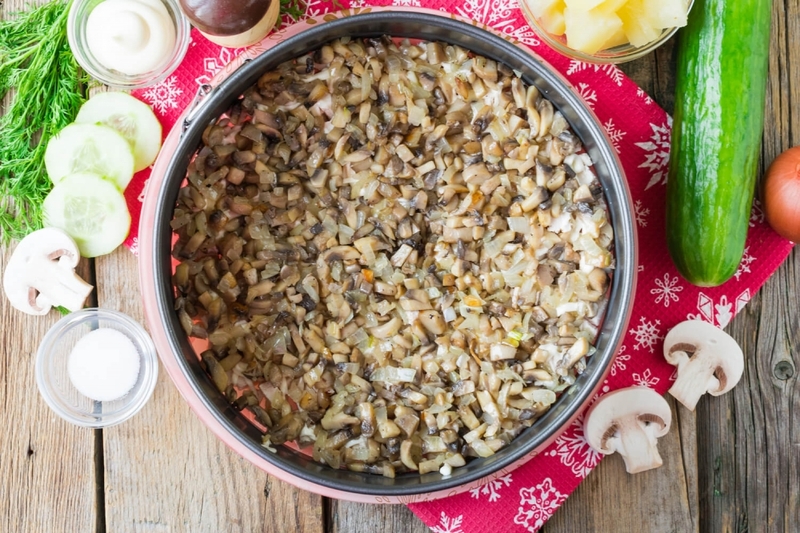 Decorate salad with slices of champignons roasted to golden color. Also for décor we can use greenery and fresh or frozen berries. 11. Cover salad with food wrap or a cover of suitable size and send to fridge for 1-2 hours to impregnate. 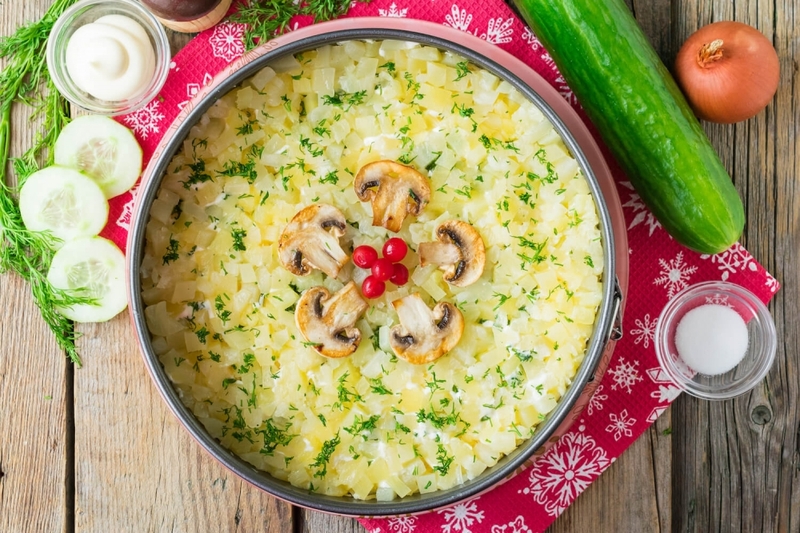 Before serving, carefully remove a culinary ring or sides of a detachable form. Bon appetite!